The laser pulses didn't grow whiskers or paws. But they became like the famous quantum-physics thought experiment Schrödinger's cat in an important way: They were large objects that acted like the simultaneously dead-and-alive creatures of subatomic physics — existing in a limbo between two simultaneous, contradictory states. And the lab in Finland where they were born had no limit on how many they could make. Pulse after pulse turned into a creature of the quantum world. And those "quantum cats," though they existed for only a fraction of a second inside the experimental machine, had the potential to be immortal. But it didn't have to be that way, Hacker told Live Science. "An optical state can live forever. So if we had sent the pulse out into the night sky, it could live for billions of years in its [cat-like] state." Here's how it goes: Quantum physics dictates that, under particular conditions, a particle can have two contradictory traits at the same time. A particle's spin (a quantum measurement that doesn't quite look like the spinning we see at the macro scale) might be "up" while also being "down." Only when its spin is measured does the particle collapse one way or the other. Physicists have several interpretations of this behavior, but the most popular (called the Copenhagen interpretation) says that the particle isn't really spin up or spin down before it's observed. Until then, it's in a kind of hazy netherworld between states, and only decides on one or the other when forced to by an outside observer. He imagined an opaque steel box, containing a cat, an atom and a sealed glass vial of poison gas. If the atom decayed (a possibility, but not a sure thing, thanks to quantum mechanics), a mechanism in the box would shatter the glass, killing the cat. If the atom didn't decay, the cat would live. Leave the cat in the box for an hour, Schrödinger said, and the cat would end up in a "superposition" between life and death. And yet, Schrödinger's cat has become a kind of useful shorthand for macro-scale things that obey the laws of classical physics, but interact with quantum objects such that they have neither entirely one trait nor entirely another. In the new experiment, described in a paper published Jan. 14 in the journal Nature Photonics, researchers created laser pulses that are in superposition between two possible quantum states. They called the little pulses "flying optical cat states." To make them, they first confined the rubidium atom to a cavity between two mirrors just 0.02 inches (0.5 millimeters) wide (about the width of a grain of salt). The atom can be in one of three states: two "ground" states or one "excited" state. When the light entered the cavity, it became entangled with the atom, meaning its state was fundamentally linked to the state of the atom. But it became uncertain whether at any given moment the light's wave was reaching the top of a hill or descending down into a valley, Hacker told Live Science. 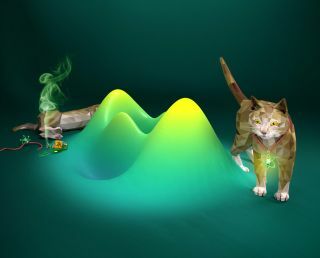 The researchers said that down the road, this ability to send moving cats from one place to another could be useful for quantum networking. That's because quantum networking will probably rely on sending light back and forth between quantum computers, Hacker said, rather than electricity. "The easiest thing to send would be single photons, but when they get lost [which happens often], their carried information is gone," he said. "Cat states can encode quantum information in a way that allows [us] to detect optical loss and correct for it. Although every optical transmission has losses, the information can be transmitted perfectly." That said, there's still work to be done. While the researchers were able to create the cats "deterministically," meaning that a cat emerged whenever they performed their experiment, the cats didn't always survive the short trip to the light receiver. Optics are tricky, and sometimes the light winked out before getting there. Also, a reasonable person might question whether these light pulses really count as Schrödinger's cats. They're certainly classical objects — meaning they follow the deterministic laws of large-scale objects — but the researchers acknowledged in the paper that at a scale of just four photons, the laser was on the edge of macroscopic and quantum scale; and so they could be said to be macroscopic under only the broadest of definitions. "Indeed, [a] few photons are nothing close to a real-world, macroscopic object," Hacker said. "The point of coherent optical pulses like the ones we used is, that the amplitude can be scaled up continuously without any fundamental limit." In other words, sure, these are some tiny cats. But there's no reason the same basic idea couldn't be used to make some giant Schrödinger felines. But the researchers were ultimately confident in using the term, and "optical flying cat state" does have a ring to it.